Ever since April, the otherwise drab and colorless Fed Beige Book, was notable for one specific trend: a rising frequency of the word "tariff" (and its variations) with every subsequent report, confirming that in addition to the usual concerns businesses voiced to the regional Fed such as labor and prices, one of the growing worries amid local companies was the impact of trade war on future business. And, as we noted back in November , with the Trump-Xi summit fast approaching, the Beige Book confirmed that with no less than 51 mentions of the word "tariff", most companies were on edge over future trade prospects. However, last month when the December Beige Book was released there was one notable development: we saw the first decline in mentions of "tariffs" since May, with the word tariff used only 39 times, a steep drop from October's 51. 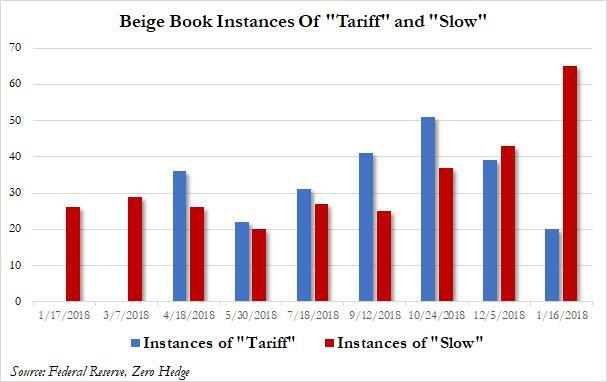 Fast forward to today when in the latest, just released January Beige Book we find that this trend has accelerated even more as there was just 20 mentions of "tariffs", a stop drop from both December's 39, and October's record 51. And while superficially this may be taken as a good sign, another, perhaps more ominous trend has emerged. But first, a quick glimpse at what else today's Beige Book revealed: a casual glance of the summary page revealed few surprises. Indeed, according to the Federeal Reserve, most regions reported growth at an overall modest to moderate pace even as the still-strong U.S. economy showed signs of slowing in recent weeks amid declining optimism. “Outlooks generally remained positive, but many districts reported that contacts had become less optimistic in response to increased financial market volatility, rising short-term interest rates, falling energy prices, and elevated trade and political uncertainty,” the report said in its summary of overall economic activity. Additionally, and confirming the Fed's recent dovish reversal, the Beige Book which is based on anecdotal information collected by the 12 regional Fed banks from late-November through Jan. 7, showed manufacturing and energy expanded at a slower pace in most districts, while non-financial services cooled in a few districts. As Bloomberg notes, today's report comes amid tension between the mostly positive outlook for the US among central bankers and many economists, and more pessimistic views expressed in recent weeks by investors. U.S. stocks had their worst December since the Great Depression, a view which is increasingly accepted by the Fed where even the biggest Hawk, Esther George recently admitted that it may be time to halt rate hikes for now. In a potentially troubling development for markets - and those keeping tabs on wage inflation - the Fed pointed to continued strong jobs gains and robust consumer spending, suggesting more wage inflation may be imminent even as financial markets have been shaken by slowing global growth, a tightening of financial conditions caused by interest-rate hikes, trade disputes and the partial U.S. government shutdown. Curiously, the now record long government shutdown received just one specific mention in the report on the way it affected agricultural markets in the Chicago district, specifically noting that "a second round of payments from the Federal Government's Market Facilitation Program also supported farm incomes (primarily for soybean producers), although payments have been disrupted by the government shutdown. The shutdown also slowed the release of government reports on agricultural market conditions, leading to greater uncertainty for market participants." Meanwhile, as noted above, while the use of the word "tariff" may have declined for the second time in the past year, another increasingly more prevalent word has taken its place: as shown in the chart below, the word "slow" and its variants appeared on 65 different occasions, a notable increase from 43 in December, 37 in October and 25 in September, which is the range it had been for most of 2018. This explicitly clear hint from the Fed, or at least the various regional Fed constituent firms, that growth is "slowing" is not surprising, given that the economy is (still) growing above trend even as a slower expansion is embedded in the Fed's forecasts. But, as we noted last month, the report points to a clear late cycle market in 2019, one marked by lower risk-adjusted returns and much higher volatility, and also explains why the Fed is now actively cutting its forecast of number of rate hikes even as the market is convinced that there will be no more and the Fed's next move will be to cut rates as slowing observed in the chart above eventually becomes the next US recession some time in late 2019 and early 2020. The balance of anecdotes continued to focus almost entirely on the ongoing profit concerns companies face as a result of rising wage pressures. Finally, there were the usual memorable anecdotes from the various regional Feds, of which the Cleveland Fed's observation that trucking demand may be fading is perhaps the most notable as it confirms the "pull-ahead of imports from China" is now over, something which the Richmond Fed also echoed noting that "a display case manufacturer had Chinese goods shipped through west coast ports in order to get goods to the country ahead of an anticipated tariff increase."